Maritza Arizala was born 21 October in Colombia. It is specifically in Cali, the capital of salsa, known for its festive atmosphere, friendly temperament. Her first dance school was his family with which she grew up in the dance and rhythm. Interested in all artistic training she enrolled at choreography classes but also theatre, puppets, flute, sculpture and ceramics. Many places have seen it at work: El Instituto Popular de Cultura, Escuela de Danza Shiley Santa, Fundacion Folklorica Yurumangui and later the University Santiago de Cali as well as Universidad del Valle. In 1998, she left the Colombia to discover Europe. She arrived in Paris and enrolled at the University of Paris VIII – Arts du Spectacle reference dance. 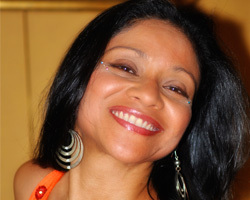 In 1999, requested by Ms. Paul, Professor of Spanish at the Institute of Notre Dame at Bourg La Reine, she also worked in the development of a project aimed to motivate the young Hispanic through the salsa, giving her dance in Spanish classes. In his teaching, respect above all its tradition and donated techniques which were transmitted to it in a spirit of freedom, solidarity and creativity. His main concern being to accompany the learner in his search for the safe gesture, wishing that “its effort become fun. Currently, it provides of Colombian salsa, cumbia, zumba classes and bolero in Paris in various Parisian dance schools as the Centre de Danse du Marais, Studio Harmonic and at the University of Paris VIII. In the clip of the song very known ‘Salsa’ (album Yo Soy) Yuri Buenaventura, 1999. In the clip of the song ‘Zhang’ of Tony Tahe (Salsa +++), 2011. TF1: Dancing with the stars. December 2012. Direct 8 Tv: New talent. 2006. Channel J: LOLLYTOP. October 2006. The local Tv. Afro Caribbean Stars. Channel 51. 07-05-2005. Channel Señal Colombia: “Paris a Ritmo Salsa”. In Orbita. August 2014. Publicar LatinoTv: “Conociendonos” April 2015.